Optimum Security specializes in providing business owners and residents in the Merritt area with the highest level of security possible. Our customers’ satisfaction is our top priority, and we work closely with law enforcement officials in the Merritt are to ensure our customers receive the best protection possible. We have security guards on staff that can protect your property 24 hours per day, seven days per week, and we also offer a range of commercial and residential security and alarm systems. Find out how we can help you resolve your security concerns today! Our security guards are highly trained to protect people, property, and assets, so whether you need personal protection or you need a security guard to watch over your home or business, we can help you. All of our security guards are uniformed to maintain high levels of visibility in hopes of deterring crime completely. However, if a problem does occur, our security guards are trained to act fast to resolve the problem. 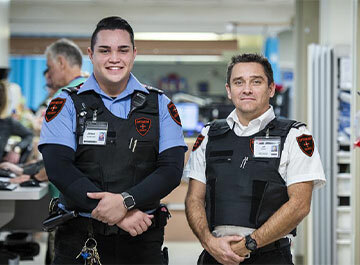 If needed, our security guards will contact law enforcement officials in Merritt, and they always report any incidents that occur to you — our customer. In addition to providing residents and business owners with uniformed security guard services, we offer a line of residential and commercial security and alarm systems to home and business owners in the Merritt area. Our alarm systems are designed to detect home invasion. They also monitor your property for other forms of danger including smoke and fire, flood and water damage, high carbon monoxide levels, and extreme changes in temperature. Every alarm system has a hands-free, two-way communication system that keeps you in touch with our security monitoring team 24 hours per day, seven days per week. If you own a home or business in the Merritt area and you’re in need of additional security, give us a call. We’d love to hear more about your security concerns and discuss your options with you.